Fans are waiting for Con as he approaches the Durango Boots booth at the exhibition center. Among them is Con's dear friend, Janice Lovell (right front) and her son Chase (right rear). Janice headed up the first ever Con Hunley fan club called Friends of Con Hunley back in the '80s. She is a forever fan! 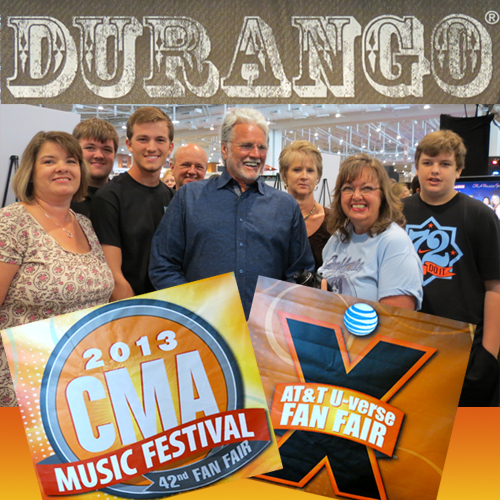 Here is a glimpse of the many smiles and hugs and memories made at the Durango booth. The fans had a terrific time chatting and getting pictures. Some are familiar faces who wouldn't miss Fan Fair for anything! There are also some newbies to the event who are excited beyond belief to be up close to their favorite stars! Con loves every second of connecting with all of these wonderful people who make it possible for him to continue his passion for making great music! middle, Con's niece and nephew Nikki and Nic Correll; and on the bottom is Jutta - a SUPER-FAN who comes all the way from Germany every year to be at Fan Fair! CMA-Fest 2013 has been so much fun! The new Music City Center is a great facility and the folks there really did an outstanding job making things accessible, fun and exciting for the fans...and really for the artists, too! We look forward to being a part of the experience for years to come....see you in 2014! And click here to see how Con's day starts out at WSM-AM.